If he/she/they are successful, Waterfox will be my secondary browser in place of FF (of course, PM is my main browser). So long Firefox. Fun fact, on my main gaming machine I have Waterfox installed (I never had to use it yet) along side Pale Moon, but not on my main browsing machine. My main browsing machine runs 32-bit windows so I have Pale Moon and Firefox (I only really use Firefox for college and uploading pictures to imgur). I've had Waterfox installed and used it alongside PM since I got my Win8.1 laptop. (Before that I had XP.) But there are things about Alex''s plan that make me think I may just give up on it. Forking from 56 seems misguided. I'd prefer a fork of 24ESR (yes I'm serious) or at least 38 or 48 (WF48 was pretty good). 52 is already having problems, and there is nothing worthwhile being added in these new releases, just more removed. And he's doing both ESR and rapid release versions - why? I could go on but there's no point - he is following his own ideas. So, maybe it's time to let it go. I'm getting the idea it's probably targeted more for kids anyway than for old geeks. You made me laugh so hard I choked on my bottled water. GreenGeek wrote: I've had Waterfox installed and used it alongside PM since I got my Win8.1 laptop. (Before that I had XP.) But there are things about Alex''s plan that make me think I may just give up on it. Forking from 56 seems misguided. I'd prefer a fork of 24ESR (yes I'm serious) or at least 38 or 48 (WF48 was pretty good). 52 is already having problems, and there is nothing worthwhile being added in these new releases, just more removed. And he's doing both ESR and rapid release versions - why? I could go on but there's no point - he is following his own ideas. So, maybe it's time to let it go. I'm getting the idea it's probably targeted more for kids anyway than for old geeks. But my understanding is that he is restoring NPAPI plug-in compatibility removed from v52. What is it that you're getting issues with? If he is able to make Waterfox work in a more conventional way (with XUL and NPAPI goodies back in) what's wrong wit using a more modern Gecko? FTR: restoring NPAPI support to more than just Flash is as simple as flipping one build config setting. That takes no effort at all. (and ESR has this flipped already anyway). In fact, Alex told me he hasn't touched the Mozilla C++ code at all ever since he stopped making builds with the Intel compiler, so it's all just reconfiguration and nothing else. 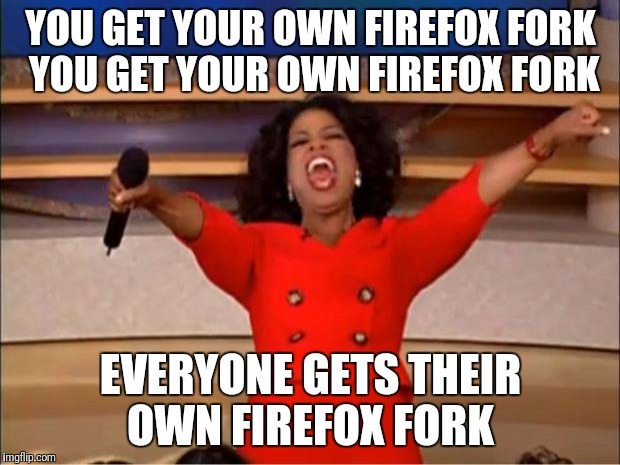 If he wants to really fork Firefox this time, it'll be a different story. Jody, I guess 52 is OK; it's running OK for me (it was other people's trouble; now resolved). But what are they adding from 52 to 56 versus what they are removing? And 52 ESR will end up getting security patches longer than 56. Maybe he intends on doing his own 56 ESR, but I still don't see the point in clinging to the last possible release. SeaMonkey is staying with 52 ESR (2.49 in SM). I wonder what is going to happen once Firefox 57 hits. The simple users without any add-ons will continue to use Firefox no probs. But what about the powerusers? A huge chunk of the fanbase will be extremely pissed about the loss of actual add-ons I'd wager. Not sure in how far Pale Moon can profit from this situation, as its greatest strength is also its greatest weakness: The Firefox 28ish interface. Some users don't know that they'll have to grab older versions of their respective add-ons in order to run them in Pale Moon, sometimes losing out on added functionality as a result. I really believe there is a market for a Firefox-alike browser derived from version 56 which would serve as a drop-in replacement for the current Firefox, similar to what LibreOffice did for the OpenOffice community. Waterfox could fill this void. As I know Matt A. Tobin has ported the classic interface over to the Gecko 38 platform code this question goes specifically to him: Would it be possible to port the Waterfox interface over so that the browser uses Goanna as its platform code? If so, how would it affect most current versions of add-ons? Aren't they written with Gecko 56 at max. in mind? Which possible incompatibilities would surface?